Gold gold gold, oi oi oi .. it was one hell of a northern winter for Aussie riders, on one plank or two. Our snowboarders collected more precious metal than some countries have left in the bank at the Snowboard World Champs in Spain (onya Holly Crawford, Alex ‘Chumpy’ Pullen & Nate Johnstone), then the world’s leading lady of slopestyle, Anna Segal, freshly recovered from a nasty injury at Thredbo late last season, came back cool as a cucumber to take out the first ever World Championship Slopestyle skiing gold medal in Park City. Nick Franklin-Jones caught up with her between events. Congratulations on your northern winter, great comeback and thanks for the time for a quick Q & A. Thanks. No problem, love to chat. Going way back, when did you get confidence to pursue a career as a professional skier? Competition life can be pretty grueling. After I quit moguls my first season freeskiing overseas was just a test (05/06). I was coming back from a blown ACL – my first major injury, and wasn’t sure how I would hold up. I also didn’t know if I’d be any good in comparison to the US and Canadian girls. I had fun that first year and met a lot of cool people. However it wasn’t until the next season (06/07) that I thought I could actually do well. I entered the US Open, just hoping that I could make finals. I qualified first and then won the event. It was completely unexpected. It definitely gave me some confidence in my skiing. What do you think were your major steps forward? The U.S Open was a big step forward. I was already riding for K2 Australia, but the international K2 team manager was at the bottom of the course when I won. He was stoked and put me on the international team. I lived in Breckenridge for two seasons before I started riding for the Breck team. I met the team manager at X-games after I won. She congratulated me but had no idea that I was living in Breck. When she found out, she emailed me and offered me a spot on the team. In my experience winning big comps has been good for my career, but no event has been a life changing experience. It definitely helps for my profile as a skier, but it’s not like team managers began knocking down my door with trying to sign me with huge contracts. I think that’s what a lot of kids imagine. You smashed your leg up pretty bad late last Aussie season. Injuries are always untimely, and painful. Can you tell us about that? The ankle injury in Thredbo was definitely a low. 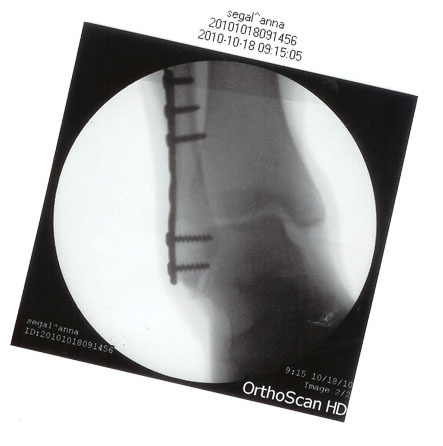 I tore my medial ligament and sustained a spiral fracture to my fibula. It was pretty damn painful. A lot of force had to go through my leg in order for it to break in my ski boot. The most frustrating part was that it was my last day skiing for the season. I actually wasn’t planning on staying for the rail jam. My sister and I were going to drive back to Melbourne straight after the Rip-Curl Pro so I could make it to uni the next day. But I’m always trying to squeeze too much in. I wanted to be part of it, so I convinced my sister to stay, even though we were both tired and it was pouring with rain. I guess I learnt a good lesson – when you’re tired, sometimes you just have to say no. From there you had a pretty amazing recovery. You definitely put the effort in at the gym. How did you feel leading up to your first competition for the northern winter? I was a little anxious about this season. I didn’t know if I would be ready in time to ski only three months after major ankle surgery, but so far I’ve had a lot of fun. I had to take it really easy for the first month. I skied a bunch of groomers and some great early season pow in Vail. I had to opt out of my first major comp as I wasn’t ready to jump yet. After I started jumping again, I felt OK on my skis, but not 100%. I did ski pretty average at X-games, especially in comparison to all the other girls, who were really throwing down. I was a little bummed afterwards, but knew what I had to improve on and how I would have to go about it. Since then, each week I have been feeling increasingly more comfortable on my skis. You still finished in 6th place at the X-Games, in your first competition after a major injury. From there it was the Worlds at Park City. Can you talk us through that comp? I qualified 8th and knew that I would have to step it up for finals if I wanted a shot at the podium. I did lip-slide onto the down bar, 270 out of the A-frame rail, 180 over the bonk feature, to switch left 5, left 7 mute, then right flat 3 critical. How do I work that out, ummm .. I have a selection of tricks that I know that I can stomp. I try to do at least one switch trick in my run and it’s also good to spin both ways (left and right). In practice I try to feel out the course and decide what tricks will work well on each feature, put together a run in my head, then give it all a try. Great win! 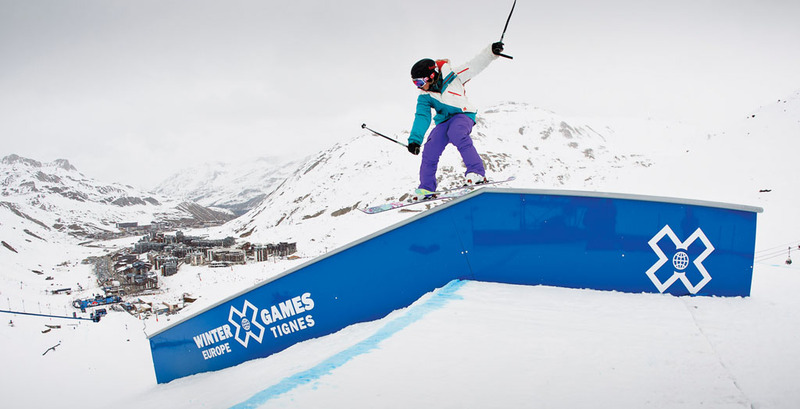 The world’s first female Slopestyle champion! Was winning the Worlds at Park City your biggest achievement? I think winning X-games was my biggest achievement. But winning World Champs has also been a massive highlight. Do you find any differences between official FIS events and the X-Games? X-games are a multi-million dollar production put on by Disney/ESPN for a worldwide audience. However there were some differences between the two. For World Champs, each day – training and competition – started at a crazy hour of the morning. We were on the lift as the sun was rising. Skiing was over by 1pm, and there was no-one else using the course after us, so there was no reason why we couldn’t start later. Then of course there was the drug testing. It was pretty funny seeing some of the boys react to the situation and it definitely made the event seem more ‘official’ and monitored. Looking ahead to a possible Olympic inclusion if skiing Slopestyle is included into the Olympics are athletes going to have to choose FIS events over the Dew Tour and X-Games and vise versa? It’s going to be a challenge for the athletes there I guess and that raises a few issues – especially if there is going to be some qualifying and they have to do X amount of events or something prior on the official circuit? That’s one thing that I’m a little worried about. I don’t want to have to choose between doing FIS events and doing events such as X-games and the Dew Tour. It would be cool if they could use the events, which are already in place, and the AFP (Association of Freeski Professionals) ranking system to determine national teams. That’s how the US chose their team for the World Champs in Park City. But I have a feeling that FIS wouldn’t agree to this. Would you make the Olympics your main focus if it does get in? Do you plan on skiing at the top level for the next three years – can your body can handle your current lifestyle? As long as I concentrate on keeping fit and healthy, I think I’ll be fine to compete in three years. There are always injuries in this sport, but there’s no point worrying about freak accidents that you can’t foresee. Any plans for life beyond competition? I’ve been chipping away at university since I finished school. The last few years I’ve been taking first semester off and just studying for second semester. I’m not 100% sure what I want to do after skiing, but I do know that I want a degree (or two) to fall back on when I’m done. I’d really like to stay in the action sports industry, as I love the lifestyle and the people who are involved. I’ve gotta hit you up on the judging. There are slight differences between the judging formats at FIS events when compared to X-Games and Dew Tour. As a competitor did you feel comfortable with the judging format at the FIS World Champs? I really wasn’t aware of how they judged at the FIS event or how it was different to other events, I just concentrate on skiing my best. It’s a judged sport and very subjective. Each different judge has their own opinion about what is more ‘stylie’ and which tricks are more difficult. Sometimes things go your way, sometimes they don’t. It’s just part of the game. I guess that’s the best way to be. Where does a Slopestyle judge come from? Slopestyle competitions have been around for the last 12 years and there are some well-seasoned judges out there. The judges used for the World Champs were a selection of judges who have been judging the Dew Tours, X-games and Open competitions. A lot of these guys are ex-professional freeskiers. So you feel the judging style/criteria between World Cup events and say the X-games is pretty similar? It seemed to me that the judging was pretty similar. They rewarded fluidity, degree of difficulty, amplitude and style. What are your thoughts on Australia possibly staging a World Cup Slopestyle event? That would be awesome if Australia was willing to invest in a World Cup slopestyle event. It would be the best way to bring the sport to the Australian public and mainstream Australian media. It worked with aerials, so there’s no reason that it couldn’t work with slopestyle. Thanks Anna. Wanna go skiing?